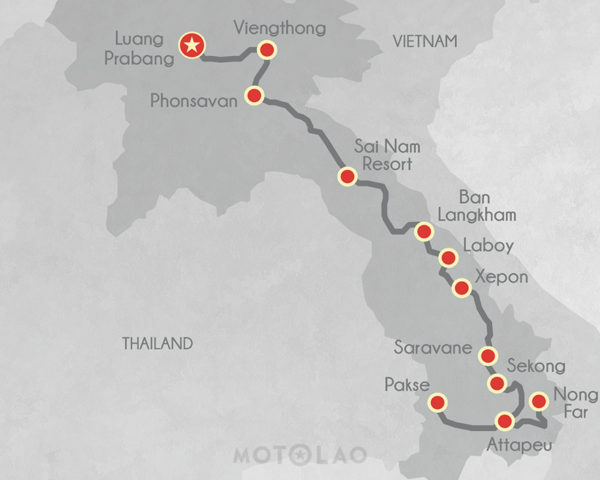 This adventure takes us nearly the entire length of Laos. Along the way we will visit some of the historic sites and remnants of the American War that are lost in time. The natural landscapes along our route makes for some great riding. There is no better way to see the countryside, the people and their culture than traveling on a motorbike through the different provinces, flat lands, mountain ranges and through sections of the Ho Chi Minh Trail. We will also cover some parts of the trail that made it famous. This is a serious ride that shows Laos in its full glory. Leaving Luang Prabang bright and early, we will head to Pakseng and then hit beautiful trails and single-track off-road sections. We will follow the rivers north and on arrival we can go bathe in the hot springs at Viengthong. 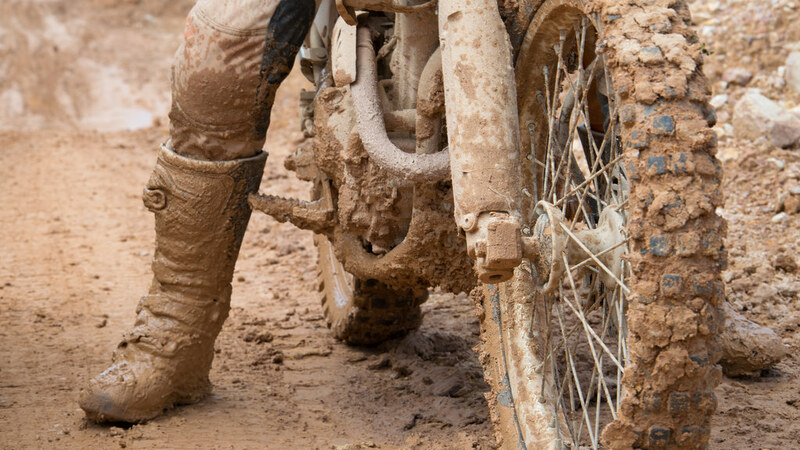 Today will be a shorter day that will be mostly off-road. We will visit Lima Site 36 on the way down to Phonsavan. Here the old airfield lies abandoned with many reminders of the War. Afterwards we will head back on the road into the jungle trails to Phonsavan and onto the Plain of Jars, we will spend the night. before heading up through the karst limestone mountains of Khammouane Province. Today is long day with many kilometres to cover. Some of the route will be Tarmac, and provide a chance enjoy the spectacular mountains en route to our destination. We will spend the night in the Sainamhai resort along the banks of the Nam Hi River. After a short ride east along tarmac roads in the morning, we will go south over the Nakhai Platue which has unbelievably stunning views. 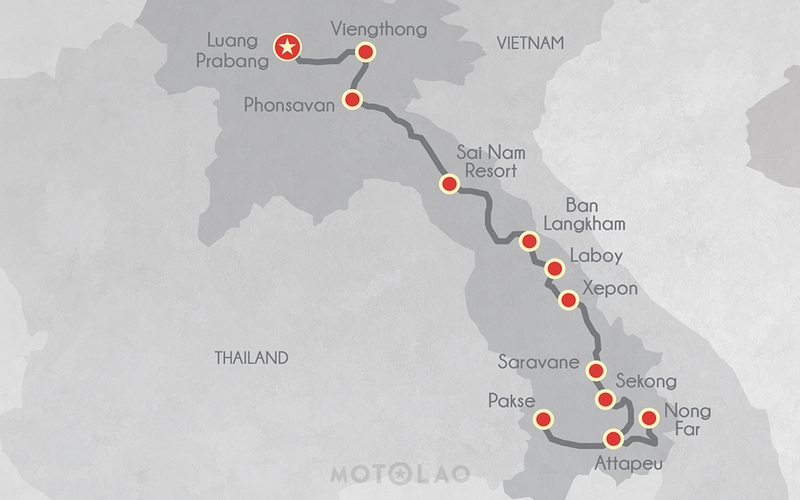 We will then ride along a short route before finally getting on The Ho Chi Minh Trail up to the Mua Gai Pass. Here we can explore the start of these famous war-era trails. Today includes an exploration of the Ho Chi Minh Trail, river crossings and a lot of history. It will primarily be dirt roads all the way to Ban Laboy Ford, which is considered to be most heavily bombed place on the planet. We will ride through some strategic villages that were used during the war and see some bomb craters and original cobblestone paths that will transport you back in time. The day will start with a visit to the War Museum in Ban Dong before we take the bikes back down the trail into Saravane via Ta Oy. This day will be a fascinating ride with some spectacular river crossings and some routes through the jungle before we arrive in Saravane. Today will be a very easy day in the saddle. The easy route will give us a bit of time to rest and a chance to clean up our gear and get some washing done. We can spend a lazy afternoon with the locals, where you can be certain that there will be plenty of beer and some afternoon sunshine. Today we head east to toward Vietnam and then take the trails south. These are well-used parts of The Ho Chi Minh Trail, where we can explore it en route to see what we may find. The area is quite interesting during the war, which saw much activity in the area. We will spend the night in Attapeu and dine by the river on a floating barge. Today is another big day with some long Tarmac sections. There is only one way in and out of Nong Far Lake, and it consists of a long climb up the mountaintop complete with stunning views of the Volcanic lake — a natural beauty spot not seen by many. This is our final day! We will ride the 18b road towards Pakse, with plenty of rivers and forests to make it a great ride. On arrival to Pakse we will visit Wat Phu archeological site. Our day will finish in nice hotel where we will park our motorbikes and enjoy an evening reliving the last ten days of the adventure. 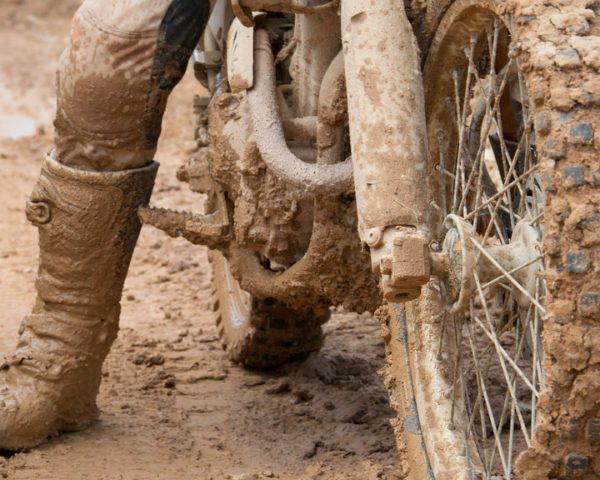 Getting dirty and riding off-road in Laos.